According to sexual selection theory, females should selectively mate with high-quality males to enhance offspring survival and maximize reproductive success. Yet, chimpanzee (Pan troglodytes) females are known to mate promiscuously. Although there is substantial rationale for a promiscuous mating strategy, there is also a strong expectation that females should be selective, and the question arises as to whether promiscuity precludes female choice. 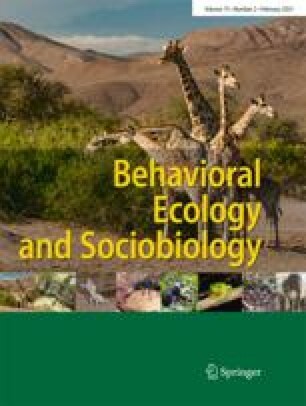 The aims of this study are to: (1) compare wild female chimpanzee sexual strategies throughout estrus, and (2) determine whether females exhibit mate preferences for particular males. Over 2,600 h of data were collected on two habituated chimpanzee (Pan troglodytes verus) communities in the Taï National Park, Côte d’Ivoire. Female mate preferences were measured by quantifying proceptivity and receptivity toward males. Results indicate that all females exhibited proceptivity and resistance to male solicitations, but that there was substantial variation in their magnitudes within and among females. Female proceptivity rates were lower and resistance rates were higher in the periovulatory period (POP) when conception is most likely. Females were more selective during POP, and more promiscuous outside of POP, suggesting that females may follow a mixed reproductive strategy, being selective when conception is likely and more promiscuous when conception is unlikely. Results from this study emphasize the importance of considering the fertility window when determining female mate preferences, and of examining female behavior in POP and non-POP phases separately when evaluating hypotheses for multi-male mating. The authors wish to thank the Centre Suisse de la Recherche Scientifique, the Ministère de la Recherche Scientifique in Côte d’Ivoire, the Ministère de l’Agriculture et des Resources Animales, Côte d’Ivoire and the direction of Taï National Park for permission to conduct this research. R.M.S. would particularly like to thank Diane Doran for her guidance and support throughout all phases of this project. Additional thanks go to John Fleagle, Patricia Wright, Charlie Janson, John Polk, Linda Vigilant, Martha Robbins, Valentin Gagnon, Camille Bolé, Nicaise Oulaï Daurid, Jonas Eriksson, Cathy Crockford, Tobias Deschner, Ilka Herbinger, and Roman Wittig. Daniel Stahl provided invaluable help with statistical analyses. We are very grateful for reviewers’ comments. Quidel Corporation generously donated ovulation and pregnancy test kits. Funding was provided by a National Science Foundation doctoral dissertation grant to R.M.S. and the Max Planck Society for the Advancement of Science. This study complies with Côte d’Ivoire regulations.